II. 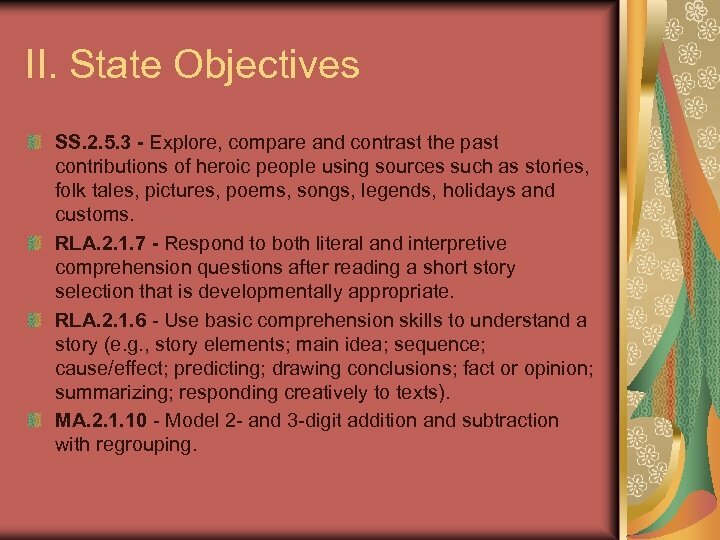 State Objectives SS. 2. 5. 3 - Explore, compare and contrast the past contributions of heroic people using sources such as stories, folk tales, pictures, poems, songs, legends, holidays and customs. RLA. 2. 1. 7 - Respond to both literal and interpretive comprehension questions after reading a short story selection that is developmentally appropriate. RLA. 2. 1. 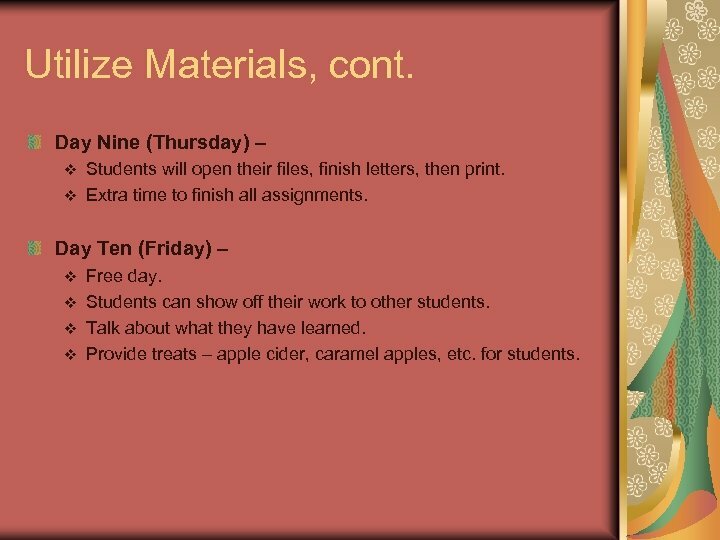 6 - Use basic comprehension skills to understand a story (e. g. , story elements; main idea; sequence; cause/effect; predicting; drawing conclusions; fact or opinion; summarizing; responding creatively to texts). MA. 2. 1. 10 - Model 2 - and 3 -digit addition and subtraction with regrouping. State Objectives, cont. RLA. 2. 2. 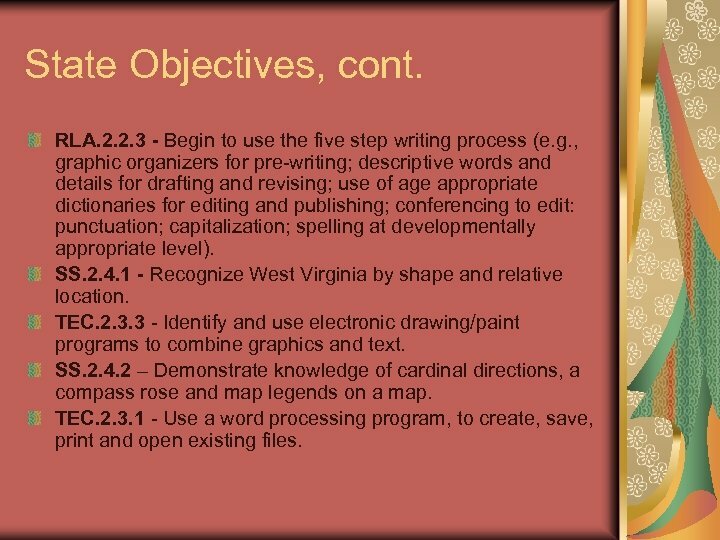 3 - Begin to use the five step writing process (e. g. , graphic organizers for pre-writing; descriptive words and details for drafting and revising; use of age appropriate dictionaries for editing and publishing; conferencing to edit: punctuation; capitalization; spelling at developmentally appropriate level). SS. 2. 4. 1 - Recognize West Virginia by shape and relative location. TEC. 2. 3. 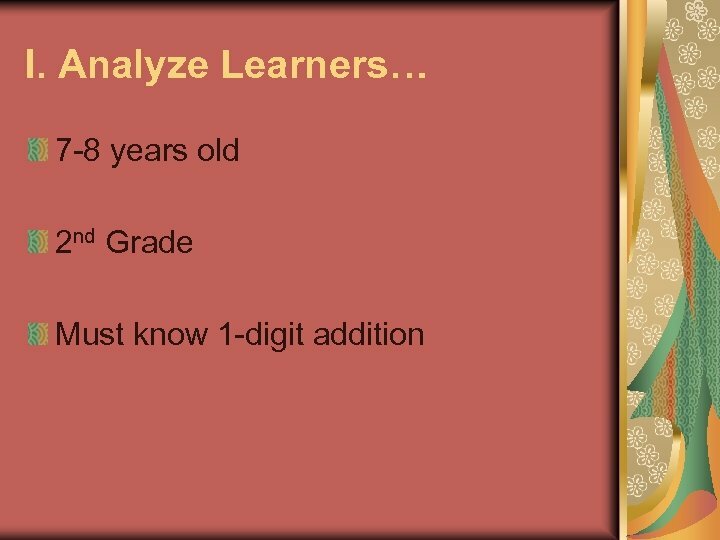 3 - Identify and use electronic drawing/paint programs to combine graphics and text. SS. 2. 4. 2 – Demonstrate knowledge of cardinal directions, a compass rose and map legends on a map. TEC. 2. 3. 1 - Use a word processing program, to create, save, print and open existing files. III. 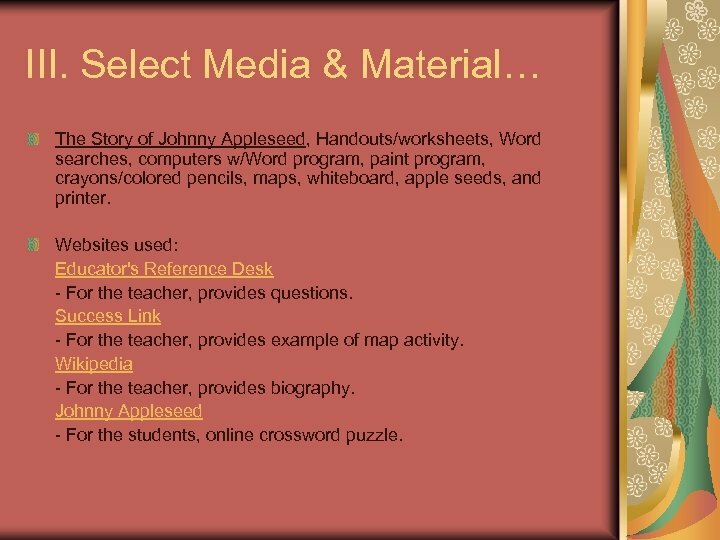 Select Media & Material… The Story of Johnny Appleseed, Handouts/worksheets, Word searches, computers w/Word program, paint program, crayons/colored pencils, maps, whiteboard, apple seeds, and printer. Websites used: Educator's Reference Desk - For the teacher, provides questions. Success Link - For the teacher, provides example of map activity. Wikipedia - For the teacher, provides biography. 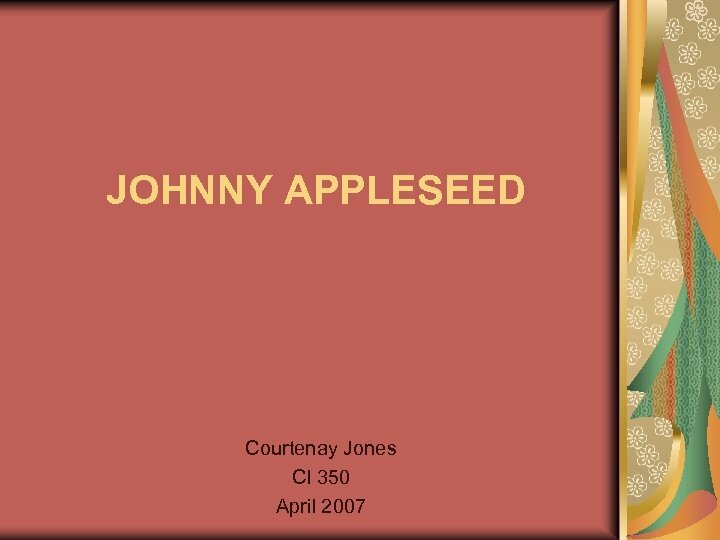 Johnny Appleseed - For the students, online crossword puzzle. IV. 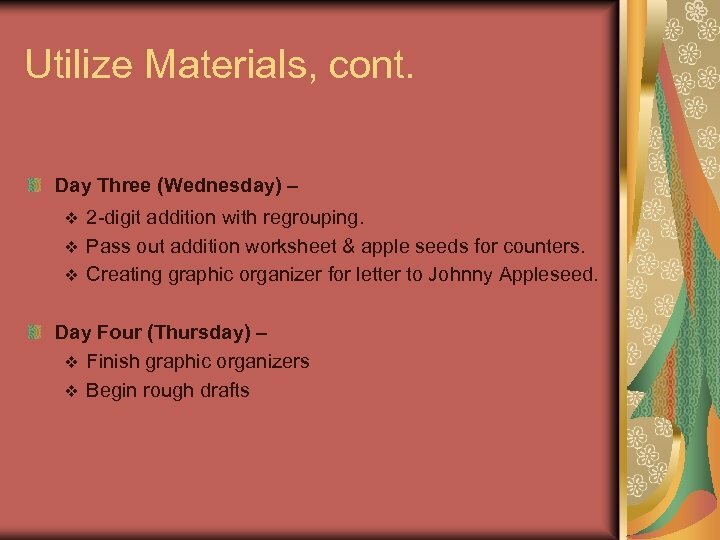 Utilize Media & Materials… Hands-on, brief lectures, activities, student oriented. 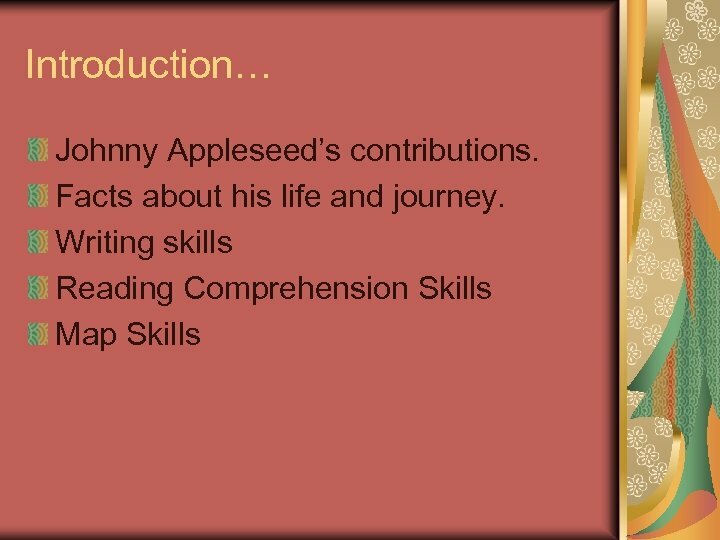 Day One (Monday) – v v v Read The Story of Johnny Appleseed. Class discussion of his contributions. Facts about his life. Define folk tale & legend. Crossword puzzle activity. 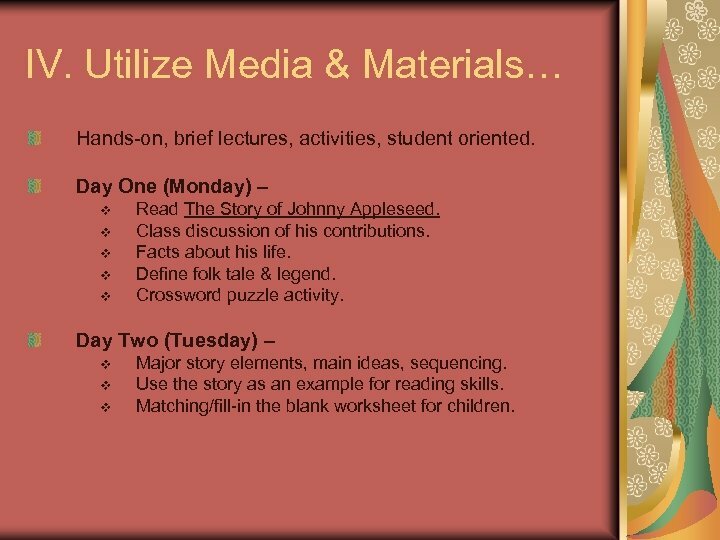 Day Two (Tuesday) – v v v Major story elements, main ideas, sequencing. Use the story as an example for reading skills. Matching/fill-in the blank worksheet for children. Utilize Materials, cont. 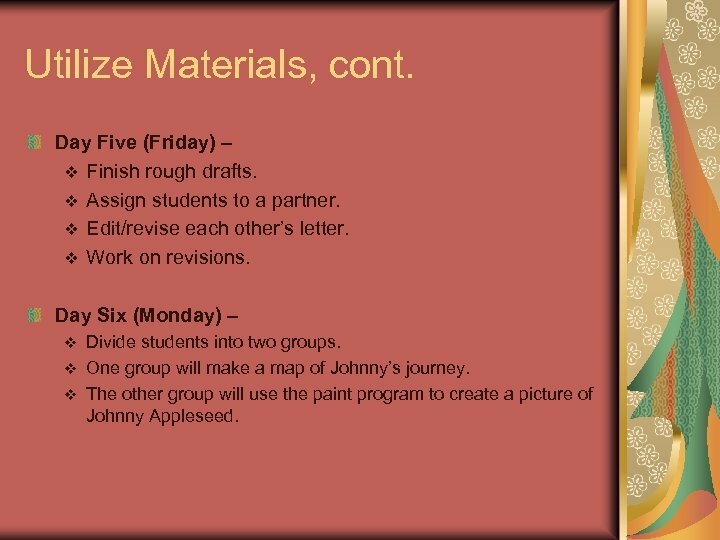 Day Seven (Tuesday) – Group one will finish maps, include title/compass rose/legend v Group two will finish picture and print. v Switch groups’ assignments. v Day Eight (Wednesday) – v v v Finish maps/pictures. Finish revising rough drafts. Students will begin typing their final drafts on Word program. Coloring pages, word searches, provided for students due to number of computers. 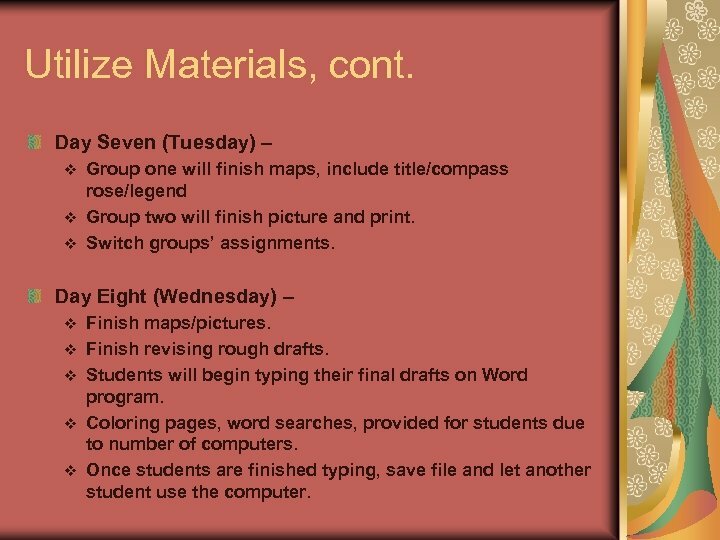 Once students are finished typing, save file and let another student use the computer. IV. Require Learner Participation… Hold students’ interest by involving them in activities. Hands-on assignments. Creativity/Imagination. Computer projects. 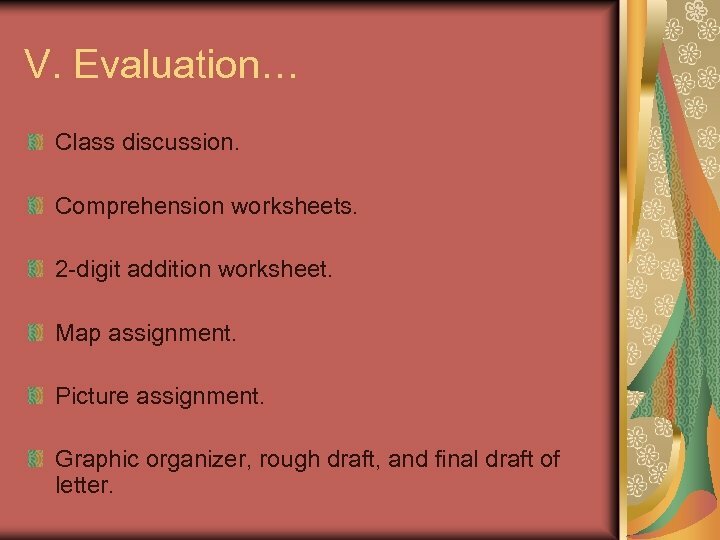 V. Evaluation… Class discussion. Comprehension worksheets. 2 -digit addition worksheet. Map assignment. Picture assignment. Graphic organizer, rough draft, and final draft of letter.